Every year, thousands of train derailments and accidents occur in the U.S. with many happening in the Chicago metropolitan area. Derailed train accidents often cause serious life-threatening injuries and death to passengers, along with innocent bystanders, pedestrians and motorists. When a train carrying loads of toxic chemicals derails, many individuals in the community can be exposed to toxic spills. The hazardous chemicals often include phosphoric acid, hydrochloric acid and others. The exposure often causes significant injuries and death. Explosive chemicals including fuel and methanol often result in catastrophic railroad fires. Many times, the toxic chemical spill produces long-lasting environmental damage to the community. Any toxin-compromised water, land and air in the areas surrounding the spill can create a contaminated environment for decades. Any train derailment can be catastrophic. Because of that, railroad companies and maintenance crews are held to a high standard of liability. In fact, both state and federal governments regulate the railroads as a recognized common carrier. It is the common carrier regulations that hold the railroads liable and responsible for even a slight act of negligence. 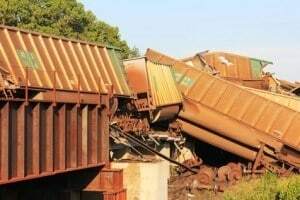 Many victims of a derailed train accident seek legal remedies to hold the common carrier, maintenance crews and operators liable for their negligence. Often times, the victims will hire a reputable personal injury attorney that specializes in train accidents. Typically, the lawyer will investigate the accident to determine if adequate compensation can be obtained for their client that has suffered injury or death. Laws governing the railroad require the common carrier take reasonable action as a preventative measure against serious injuries and wrongful death. Because of that, attorneys will usually investigate the accident thoroughly to determine if there was any failure in providing reasonable care. This could include negligence caused by the engineer or conductor, defective train parts, a mechanical failure, or defective railroad track. Crew member negligence could include distractions of the engineer caused by another worker or cell phone. Other negligence actions could include operating the train under the influence of alcohol or drugs, workers improperly switching tracks, or employees pushing trains without following specific safety guidelines and precautions. Filing a claim for financial recompense in a train accident usually requires the skills of legal counsel. Rosenfeld Injury Lawyers LLC at (888) 424-5757 handle personal injury cases for victims suffering injury or wrongful death in a railroad accident. The law firm works on contingency, meaning no upfront fees are paid out of pocket by the victim or the victim’s family. The attorney’s fees are paid out of the award at trial of a successful lawsuit, or in an out-of-court settlement negotiated between the attorneys and the insurance companies providing insured coverage for the railroad company. What type of compensation can I get for my injuries? Who do I sue if I'm injured working for a railroad? What is the law regarding rail crossings? What are some examples of train accident recoveries?